What is, Shaken Baby Syndrome? Shaken Baby Syndrome is an injurious condition caused by the shaking of an infant or child. The action of rapidly shaking an infant or child causes the sudden forward, backward and sideway motion of the head. During the shaking action the brain is injured from hitting against the inside of the bony skull, causing inflammation, bleeding, separation of vessels and nerve fibers in the soft brain tissue on all sides of the brain. The brain of an infant or child is very soft because it has more water content and it is easier to injure than an adult brain. Therefore, less energy is required to cause lethal injury to an infant or child’s brain. In shaken baby syndrome, the eyes may get injured by the sudden increase in pressure and motion around the soft tissues that make up the delicate structure of the eyes. After the shaking, the brain and the eyes bleed inside the confined spaces they are contained in. This bleeding causes high pressure to build within the head and eyes. The damage caused by shaking the head, brain and eye structures and the increasing high pressure that follows causes permanent injury or death for the infant or child. If death does not occur the infant or child may be left with permanent brain damage, blindness, neuromuscular disability, paralysis, deafness, learning disabilities and/or a seizure disorder. Nigel Raines is the father of a 6-month-old little girl whom reportedly suffered from blunt force trauma, that reportedly took her life. “I want to know the whole truth,” he said. Anaya Jones reportedly died Sunday. Her uncle, Ronnie Wilkerson, is reportedly charged with first degree murder. Wilkerson told police he reportedly shook the baby three different times in order to wake her up, unaware of his own strength. Anaya was taken to a local hospital with brain trauma. Raines says no one told him Anaya was in critical condition until 36 hours later. He got to see his daughter, but she died the very next day. John Jones, an 18 year old Akron man who fatally injured his 6-month-old daughter was reportedly to 15 years to life in prison. John Jones reportedly shook Jada Ruiz-Jones violently March 19, 2010, causing irreversible brain damage, prosecutors said. She died four months later. 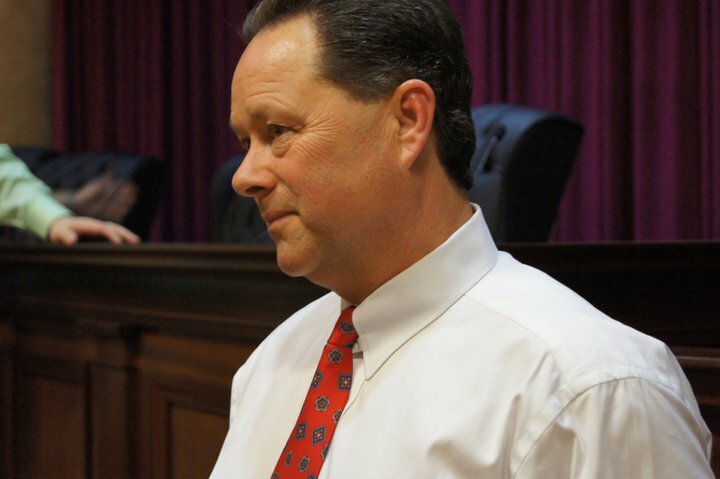 Reportedly, the sentence was imposed two days after a jury convicted Jones of murder and child endangering. An autopsy report says a baby died of severe shaking in a case that has led to the arrest of his mother's boyfriend. Reportedly, Angel Luis Santiago of West Haven was reportedly arrested due to injuries an infant sustained reportedly in his care. The report states, the infant he was caring for was shaken with so much force that his spinal cord separated from his brain. Reportedly, an 8-month-old girl who Tacoma police say was violently shaken by her father has died. Police say they were reportedly called to Mary Bridge Hospital Wednesday for a report of a shaken baby and found the infant was in critical condition and on life support. Reportedly, 20-year-old Ivory Flowers, confessed to shaking the baby Wednesday evening and causing the injuries. The father and baby were in a room alone around 8 p.m. and then he called out for help, saying the baby was vomiting and unresponsive, police said. The child was taken to Mary Bridge, where doctors determined the baby had been shaken. Justin Michael Charles Sr., 23, reportedly injured Justin Michael Jr., Cambria County District Attorney Kelly Callihan reportedly said during a news conference. The baby’s mother reportedly returned home from a neighbor’s house on Dec. 21 to find him unresponsive. “She assisted in trying to do CPR at the scene before (medics) arrived,” Callihan said. The baby was reportedly taken to Johnstown’s Memorial Medical Center and airlifted to Children’s Hospital in Pittsburgh, where he died two days later after being removed from life support, she said. In a recent report, Jonathan Dominguez, father of 4 month old Averik Dominguez, was reportedly sentenced to 4 years in prison for the permanent injuries Averik sustained causing significant disabilities. "Because of your actions, he will never be the boy that he would have become had you not committed the acts you committed," the judge said. " … You will always be Averik's biological father but you are no longer his dad. … You can't be. You almost killed him." Reportedly, on Aug. 13, Dominguez squeezed the child with enough force to leave bruises on his back and fracture three ribs, Mr. Pituch said. The next day, he reportedly shook Averik with such force that it caused bleeding on the brain. Dominguez reportedly apologized for his actions and said that he hoped one day his son and his son's mother would forgive him. Calling it "the biggest mistake I will ever make," Dominguez said he took responsibility for his actions. "At the end of the day he is my son," he said. "I love him with all my heart." Judge Zmuda reportedly said it was not love but selfishness Dominguez showed the day he hurt a crying baby. "You may have loved him with all your heart but you needed to love him with your head and you didn't do that," the judge said. "The life sentence will be knowing that your son will never be the son he could have been." Leon Charles Wheeler III, AKA Leon Charles King is reportedly facing charges for child abuse creating injury, for reportedly shaking his 3 month old infant son. The 3 month old infant, whose name is Donovan L. Huffman, reportedly is suffering both physical and neurological damage due to being violently shaken. The incident reportedly took place at their residence on December the 8th, and as the infants mother, Lacy Huffman, was reportedly returning home from work, after receiving a ride to their home by her boss, found Wheeler, who had reportedly been at home with the 3 month old boy, and their two older children, coming out of the home to reportedly ask the mothers boss for a ride to the hospital because reportedly something was very wrong with the 3 month old boy. Huffman said she told him her boss couldn’t take them to the hospital because he had to get home to his family. According to this report, the mother, Lacy Huffman later told the investigators that the baby was up and down all night and she noticed his eyes reportedly “did not look right” like he ”was not there.” The next morning Huffman reportedly said the baby’s right leg and arm began shaking and an ambulance was called. The Child and Family Support Center and Logan Regional Hospital are both working to increase education and awareness of shaken baby syndrome by participating in the Purple Crying program developed by the National Center on Shaken Baby Syndrome. The Purple Crying Program campaign teaches parents that it is normal to have periods of inconsolable crying and, the program helps parents develop a plan for the day when the baby’s crying becomes too much to bear. “Babies have never died from being left in a crib with the door shut,” said Jolene Kobe, director of the Women’s and Newborn Services at Logan Regional. The mother of the 3-month-old boy, William Zamore, reportedly shaken to death by a 22-year-old Stamford man, Osvaldo Romero, could also be facing criminal charges based on allegations that she reportedly lied to police on the amount of time it took to call for help. William Zamore's death was reportedly ruled a homicide following an autopsy that showed the baby died from blunt head trauma and suffered injuries consistent with shaken baby syndrome. The 3 month old reportedly suffered from brain damage, retinal damage and bone fractures reportedly due to Shaken Baby Syndrome which is by violent shaking of the baby and the whipping of the head from side to side or back and forth. Osvaldo Romero is currently being held on a $1 million dollar bond. A 51-year-old woman, Shirley Ree Smith, convicted of fatally shaking her 7-week-old grandson - a conviction overturned three times by a federal appeals court, and reinstated by the U.S. Supreme Court - has reportedly asked Gov. Jerry Brown for clemency. Robert Goetze, a Salinas father, was reportedly arrested Wednesday on suspicion that he nearly beat his infant son to death. On Dec. 14, Salinas hospital workers alerted the Salinas Police Department Sgt. that they were caring for an infant in the emergency room with "extremely serious head trauma," according to the report. The two-month-old baby had life-threatening injuries that reportedly Doctors determined were non-accidental and were likely shaken baby syndrome. Robert Goetze, the infant's father, was reportedly arrested on child abuse and assault charges and booked into the Monterey County Jail with bail set at $500,000. In Rapid City, South Dakota, a sad report comes of a teenager reportedly charged with first degree murder after a 1 year old child dies of "acute blunt-force head injury, attributable to non-accidental shaking," reportedly, according to Lara Roetzel, Pennington County's chief deputy state's attorney. According to the report, the Pennington County's Sherriffs Office arrested a 14 year old male in connection, stating he is charged with second-degree murder, a felony punishable by up to life in prison. Reportedly, Robert Goetze, is the 24 year old father of a 2 month old baby reportedly seen at a Bay Area hospital for injuries consistent with Shaken Baby Syndrome. Osvaldo Romero, the 22 year old man reportedly accused of killing a 3 month old boy earlier this month has pleaded not guilty second-degree manslaughter and risk of injury to a child. In a voluntary statement given by Romero, he reportedly stated ""I grabbed him under his shoulders and shook him for about four seconds," Romero said. "His head was not supported when I did this. William felt kind of stiff at this point. I could tell that he was not breathing." An autopsy performed, reportedly shows the boy died from injuries consistent with Shaken Baby Syndrome. Kendra Fritsche, a Holdrege woman who reportedly pleaded not guilty last summer to child abuse charges from an incident at her daycare has changed her plea to no contest after the charges were amended. Reportedly doctors say the infant also showed signs of shaken baby syndrome and Kendra Fritsche reportedly told authorities that she may have put the child down in a carseat "too hard". Today, an extremely sad report came across the NBC Connecticut News, stating a man, reportedly by the name of Osvaldo Romero has been arrested and charged in regards to the death of a 3 month old boy, according to reports. Reportedly, Police have stated the young boy died on Friday, and sadly, the likely cause is Shaken Baby Syndrome. Osvaldo Romero was reportedly arrested on Tuesday night, and charged with felony risk of injury to a child, and second degree manslaughter, this reportedly stated by the Advocate. Previous court records reportedly show Osvaldo Romero was previously convicted of larceny charges in 2006, and his parole was reportedly terminated in 2009 after a breach of peace charge. Also in this report, it was reportedly stated by the Police, they are investigating the possibility the child was sexually assaulted. Each month, the Keane Law Firm brings to you a Family Spotlight. For the month of December, we would like to introduce to you Steve and Kathy Stowe, grandparents to Jared Patton. It is believed by many that a true warrior crossed over to the place that God needed him most on Friday afternoon, Dec. 11, 2009. 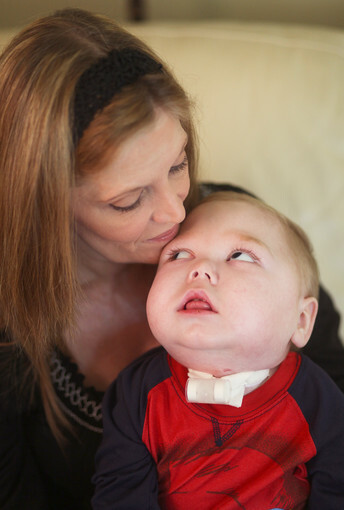 Jared suffered a severe brain injury at the early age of six weeks. All indications proved that Jared should have been at least institutionalized if indeed he made it at all. After many life threatening medical procedures at such an early age, it was clear that Jared wasn’t finished on his journey here. Never able to speak a word, he taught numbers of people vital lessons that they would have never received elsewhere. He seemed to be a professor of unconditional love. You had to leave his presence with a deeper understanding of the principals: Compassion, Wisdom, Tolerance, and Patience. Shortly after a tragic physical event, his smile would light up the heart of whoever was lucky enough to be around. Jared loved family time at night when he would sit in his Nina’s lap and wait on the popcorn being prepared by his Grandpa Steve, so that they could watch HGTV, unless the Colts or the Orioles might happen to be playing. The Family feels so blessed to have had so much time to spend with their little gladiator. 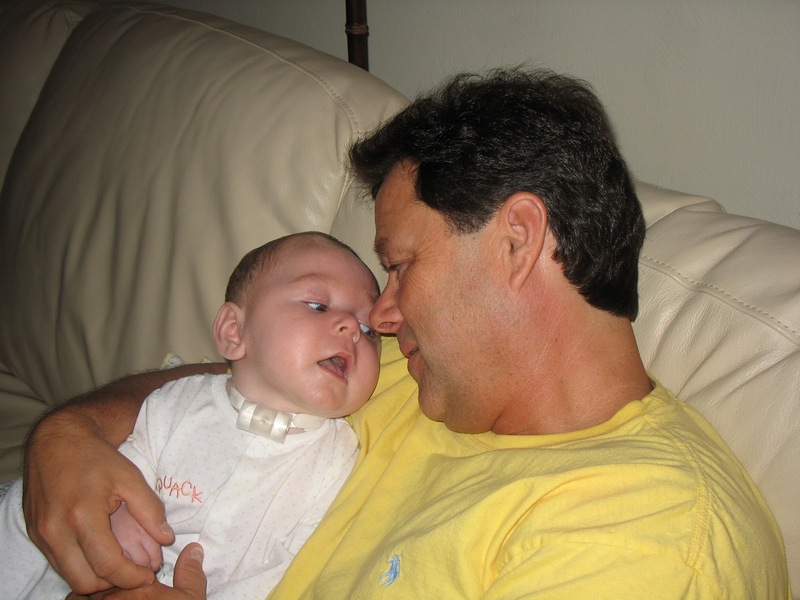 Steve and Kathy have taken giant steps to create Shaken Baby Syndrome of Virginia, Inc. in the memory of Jared, using the grief to fuel the fire in their journey to raise awareness of Shaken Baby Syndrome, and ensure that Jared's voice is heard for a lifetime. Working hours upon hours, to ensure our children of tomorrow are protected, with the parents and care givers educated, Steve recently wrote a book titled, "Jared's Journey". Such an inspiring book of love, hope, inspiration, and the meaning of life all given by Jared. You may purchase Jared's Journey today! Click Here for more information! 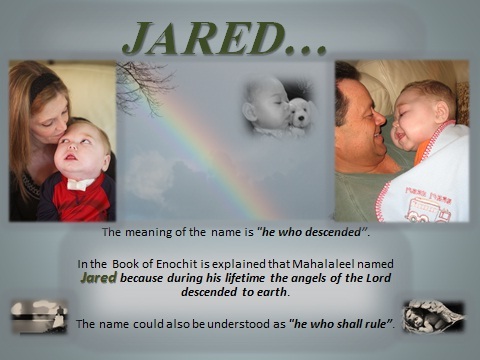 The amazing work of both Steve and Kathy Stowe, in Jared's Memory definitely do not stop there. 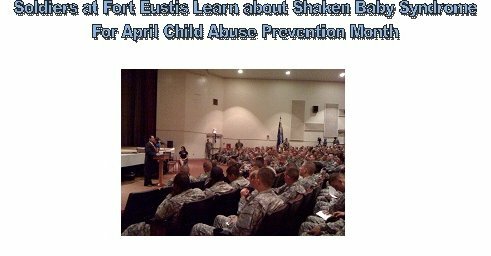 Highlights from last year (2010) for the Stowe's include, a presentation for the Child Protection Team of Hampton Virginia, the opportunity and success of educating some 4,000 American Soldiers with recognition from the base commander awarding Steve and Kathy with the "Coin of Excellence", and many more presentations, and speaking engagements. There is another phenomenal highlight to Jared's Legacy and the amazing persistence, will, and dedication by the Stowe's. In July 2010, HB 411, referred to as “Jared’s Law” was enacted. Due to the efforts of Steve Stowe and Delegate Glenn Oder, there is now an educational web-site about Shaken Baby Syndrome, with literature available. 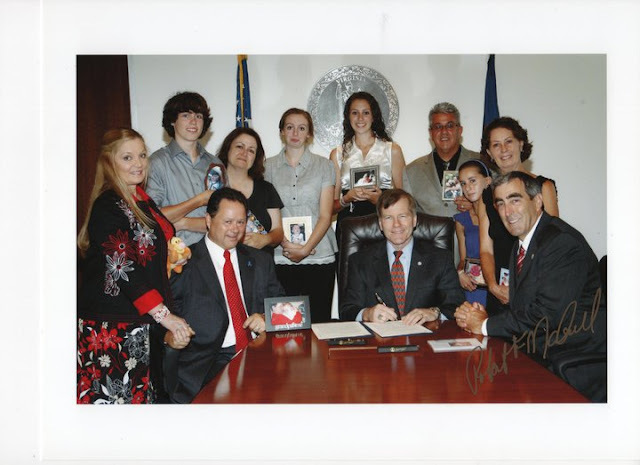 Governor Robert McDonnell signed this bill in Richmond, VA on July 29th, 2010. The Stowe’s and their friends and family were in attendance. 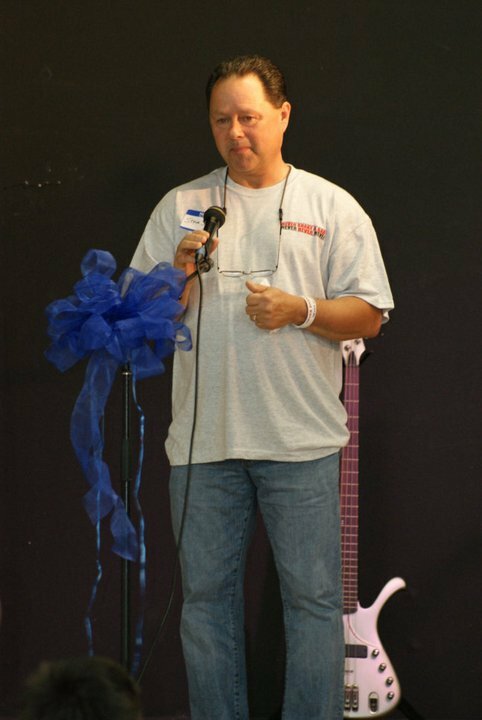 In April, 2011, Steve attended the 5th Annual Shaken Baby Syndrome Candlelight Vigil hosted by the Shaken Baby Syndrome Support Network in Sarasota, FL. Steve attended the evening vigil, along side friends he has met along the way through the journey of Shaken Baby Syndrome, whom have been affected by Shaken Baby Syndrome. Chris Keane, from Keane Law, also spoke at this event, where close to 125 families attended, all affected by Shaken Baby Syndrome. Through the loss of their grandson Jared, this December we hope you will take a moment to get to know Jared, and sign up for news to gather updates and information pertaining to their continued journey, as both Steve and Kathy in Loving Memory of Jared work to raise their voice for the Awareness and Prevention of Shaken Baby Syndrome. A very sad story today, a 6 year old boy, whom was reportedly shaken at the fragile age of 2 months by his biological father, passed away on Tuesday due to complications the child reportedly received from the traumatic brain injury due to Shaken Baby Syndrome. The boy, reportedly identified as Sam, is one of four special needs children adopted by Chris Dahlke, as reported by Dahlke's daughter Barbara Smith. In this report, the daughter, Barbara Smith spoke with reporters, and stated Sam was hooked to machines, and due to the injuries sustained when he was just 2 months old, the boy was reportedly blind, non-communicative, and had heart problems. Also reported, due to the death of Sam, Barbara Smith also reportedly stated the biological father could face homicide charges. The sheriffs department has not released any information pertaining to the biological father of Sam, or information as to whether there would be possible homicide charges. To learn more about Shaken Baby Syndrome and the Signs and Symptoms of Shaken Baby Syndrome, please click here!